National Grilled Cheese Day: Adventurist or traditionalist? HORSHAM, Pa. (WPVI) -- Are you a grilled cheese Adventurist or Traditionalist? In honor of National Grilled Cheese on April 12, Horsham-based bread company Sara Lee conducted a survey to find out more about both sides of the grilled cheese battle. Traditionalists are defined as grilled cheese connoisseurs who strictly eat bread and cheese only. While Adventurists are those willing to try anything on their grilled cheese sandwiches. The survey showed Adventurists are more likely to be blondes or red-heads. 82% of blonde Americans surveyed said they'd prefer more than just cheese on their grilled cheese sandwiches, compared to only 67% of brunettes. The survey showed Traditionalist are most likely brunettes, in their 30s, or over the age of 55. Fifty-five percent of consumers surveyed identified themselves as grilled cheese Traditionalists: bread and cheese, and nothing more. 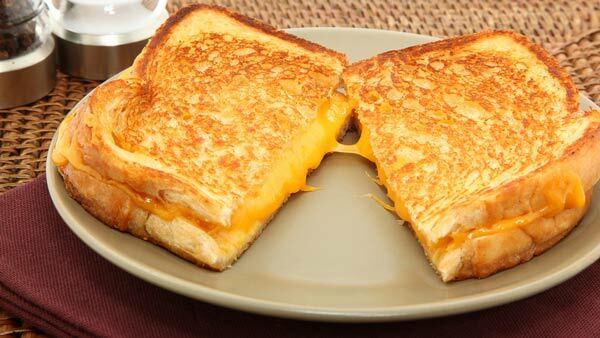 Almost two-thirds of those surveyed would eat a "mystery" grilled cheese, without any clue of what's inside! 64%, in fact. The Adventurists are willing to try mustard, tuna, sauerkraut, peanut butter or chutney on their grilled cheese. If the Traditionalists surveyed had to choose additional fillings, they would most likely include tomato (39%), bacon (38%), ham/pork (32%), or eggs (22%). Slightly more than half of those surveyed feel there's only one kind of cheese for them. The most popular cheese choices in America are American and cheddar. If you're tired of a regular grilled cheese sandwich, but not ready to take the plunge into sauerkraut, there might be a sandwich for you. So what side of the grilled cheese battle are you on: Adventurist or Traditionalist?